The closest he will ever come to happiness is when he's hurting her. Will she let him? A beautiful and twisted story of first love and innocence lost, written when the author was just eighteen. Sphinxie and Cadence. Promised to each other in childhood. Drawn together again as teens. Sphinxie is sweet, compassionate, and plain. Cadence is brilliant, charismatic. Damaged. And diseased. When they were kids, he scarred her with a knife. Now, as his illness progresses, he becomes increasingly demanding. She wants to be loyal, but fears for her life. Only the ultimate sacrifice will give this love an ending. It begun when Sphinxie's mother met her best friend as children, the two girls quickly becoming inseparable. Now one pact and decades later, the two young girls have grown into women with their own families, but still remain in each others lives. Both born within months of one another, Sphinxie and Cadence were promised to one another and now they too have become a fixture in each others lives. But where Sphinxie is an emotional and shy girl, Cadence's light burns brightly leaving Sphinx in awe of the boy who is more intelligent than other children his age. But something seemingly sinister lurks behind Cadence's eyes. Even as a young boy, he takes his emotional cues from others, not able to emotionally assess situations for himself. He doesn't feel, he cannot love, and after maliciously crushing a butterfly with no regret, it's Sphinxie's father that sees that young Cadence may need help. Now the two teens are sixteen and live an ocean apart, their mothers still in contact through phone calls and photos shared. Sphinx hasn't seen Cadence since the incident that cemented how different the boy is, now he's an attractive young man, no longer caring about emotional cues and the feelings of others... And he's dying. The one thing he wants, is to now see his childhood friend again and Sphinxie feels a sense of obligation towards the boy who left a permanent scar. Cadence is as manipulative as ever, he still feels nothing but no longer is being held accountable for his actions, confiding in Sphinx that he's been labelled as a sociopath. But when Sphinxie decides it's her duty to stay with Cadence until the very end, his toxicity just may destroy her as well. One word? Chilling. Breaking Butterflies, although has passages of brilliance, the storyline was not only unique, but was based on one characters mental illness which was portrayed with shock and horror. But the overall storyline was unhinged. It follows the story of Sphinx, who begins by telling us how her mother met Cadence's mother all those years ago. How the two created a pact to always follow their dreams, marry and both bare children for them to grow together and marry. Childhood promises that followed both women into adulthood, and yes, they were both devastated with Cadence's diagnosis as it destroyed the vision of the future both women still held. Ladies, you're grown women. Your daughter is a doormat and the other, your son is one snap away from mass killings. Think it might be time to let that dream slide. Sphinx had always been the quiet one, allowing Cadence even as children to dictate the terms of their twisted friendship. Although the adults in his life sensed there may have been an issue with the boy's mental health, no one chose to pursue it. It wasn't until he took to Sphinx with a flick knife, and only then did his mother pack him up and leave the country, running from the issue that increasingly needed to be addressed. Both mother's only cared about their friendship with eachother, and not the toxic friendship these two children had. So when we forward to after Cadence is diagnosed, I expected that perhaps he was finally seeking help. But he was diagnosed with Leukemia, not a mental illness. In a sick sense of obligation, Sphinx takes it upon herself to provide a sense of happiness during Cadence's last days. But now with a terminal illness, he has been given the freedom to do and say what he pleases and his mother and Sphinx only enable his behavior. His estranged friend actually begins to believe that she can make a difference, that Cadence actually wants her there, but he only wants to continue to hurt her. And it's not only Sphinx that suffers the consequences. Cadence's character was everything I'd expect him to be, sinister, malicious and cold. His character is unlike any of seen in young adult, and although I was horrified, I couldn't put it down. It was akin to watching a horror, covering your eyes, bracing yourself and reading on the edge of your seat. But I couldn't enjoy it. 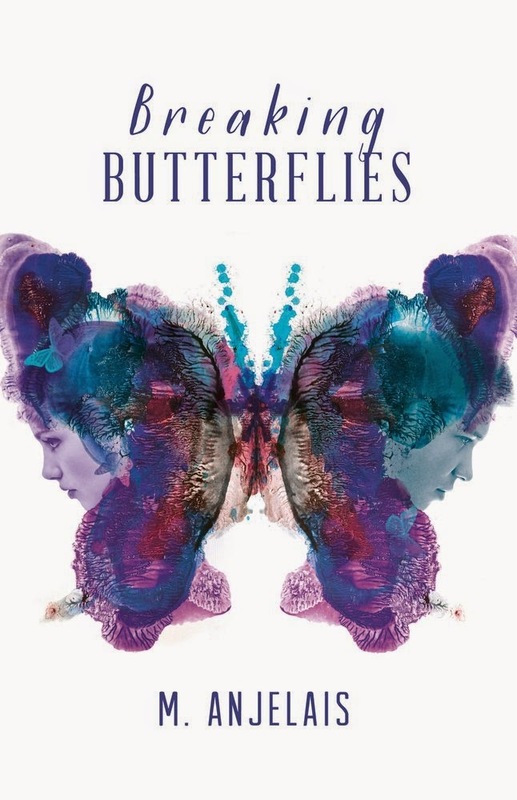 It wasn't badly written, but the storyline was just so incredibly disturbing that I really didn't know what the overall message of Breaking Butterflies was. That parents can be irresponsible and let you down? That as long as you're dying, you can mentally and physically abuse others? That it's alright to find yourself attracted to a sociopath, because the passion in which he inflicts the pain captivates you? Definitely one for mature young adult reader that enjoys dark psychologically disturbing storylines. The cover is lovely though. I've put a hold on it at the library as I really want to read this but I'm a bit more wary now. It's worth giving it a go. Cadence's character is on the verge of bone chilling, and parts are really disturbing but it just wasn't for me. I know so many readers enjoy the darker side of young adult, and this one is definitely that. I really don't know what to make of this. I hadn't put it on my TBR because the blurb wasn't really my thing and now I know that this book is definitely not my kind of thing. I'm sorry you had an awful experience with it, Kelly! I didn't know what to make of it either Chiara. It was dark, disturbing, but I still couldn't put it down. I'd still say to give it a go (I actually included my copy in your parcel that's on it's way). I'd love to see what you think of it. Okay wow. This sounds so extremely disturbing. I don't think I'd be able to read it without cringing through the whole thing. It's definitely one that I'm going to put off for a really really long time! This review was amazing. Thank you for sharing Kelly! It is. Cadence is a sociopath and the book delves into how cold and calculating he truly is. There were parts I felt for him, but they disappeared pretty quickly with how he manipulated not only Sphinx, but also his mother. I thought I would have had more empathy for Sphinx, but she came across as someone who just couldn't think for herself and allowed him to manipulate her. It's really dark and violent in places. Not one to be taken lightly. I also debate whether this is too much for young adult as well. Wow, this sounds really intense. I don't know if I'd like it-I enjoy dark stories, but this one seems a bit too messed up for my tastes. Great review! Messed up! Exactly the term I was looking for. If you love the dark side of young adult, you should really give it a go. I'm really quite sensitive when it comes to books and this was just too much for me but I'm sure others will probably really enjoy how different it is. Thanks for visiting Finley. Oh no, Sphnix is HER name, his is Cadence. They called her Sphinxie as a pet name, which made her sound like a demented fairy. I'm not sure anyone could mentally prepare for this one. Yeah, I try to see the positive side in every book, but this wasn't enjoyable for me sadly. See? Even the names had me confused! This sounds seriously messed up! Cadence doesn't sound like the only one with problems. Something must have been wrong with Sphinx as well if she voluntarily spent time with a kid who had intentionally cut her with a knife and I hate when parents ignore their child's needs because they don't want to admit something's wrong to themselves. It was, but his character was really well written as well, he was frightening and you didn't know what to expect from him. The parents didn't seem to parent at all, even without a diagnosis, they all knew he had they potential to be incredibly dangerous, but still conveniently left the two together. Okay. So the blurb itself was already disturbing, and wow, I guess I didn't expect the story to be, well, MORE disturbing. I think every character in this book sounds crazy haha but I have to admit, the more the disturb this was the more interested I am in this book. It's so much darker than the average young adult Ella, which will appeal to those who really enjoy psychological thrillers. I think you'll really enjoy this one Faye, Cadence is completely toxic and you wonder where the line between his manipulative personality and mental illness starts and ends. The blurb is creeping me out, but I'm oddly curious about how things will turn out... At the moment I'm VERY unsure about reading this one, but I might in the future just out of sheer curiosity. Awesome and very fair review, Kelly! You really need to enjoy dark young adult to get the most put of this one Aimee. There are a few disturbing scenes, one especially for those that love feathered friends. It was just too disturbing for me though. Thanks Zoe. Yeah, Cait and I are in agreement on this one, although it was well written, the characters and the toxic friendship was just too much. She allowed herself to be manipulated and hurt, it was sickening. I had to abandon Forbidden half way through, that was just too disturbing for me too. This one is creepy and disturbing, but it'll really appeal to the darker side of the young adult genre. I'm really looking forward to seeing what you think Jules. I read the blurb and was just like "WHAT? I'M SORRY. THAT'S MESSED UP. I'M SCARED"—Literally. In that order. I'm intrigued (which makes me kind of weird huh? But like i don't know i feel like reading this one would be a difficult read. It's just so different and like weird and creepy and like sad in a way. Oh no Lily, you're not alone. It's just my personal preference that I didn't really enjoy this one, but I'm pretty sure I'll be in the minority. This might be for me, Kelly. I enjoy psychological thrillers and this is what it feels like to me. The fact that Cadence is definitely and psychopath and terminal and he's surrounded by people he can easily manipulate is very intruiging for me. I do agree that this is mature YA and should be labeled as such. I think I'm adding this to my TBR. Awesome review! Thanks Amir. I really think you will too, it's actually pretty well written, and Cadence's character is eerily brilliant, but it was too much for me. No doubt this'll be well loved by the lovers of thrillers. It's definitely not all bad, it's actually quite good especially Cadence's character. He certainly has the shock and creep factor. My issue was with Sphinx and her inability to stand up to him and finding it thrilling even that he was so passionate towards her, when he was being physically and emotionally abusive. Hmmm....the synopsis sounds great. I'm sorry that you didn't enjoy it. I'm not good at disturbing storylines (unless I already know the characters), so this one might not be for me. This one eases you into the storyline though, so you do get a feel for each character. It's a quick read too. I'd give it a go Monique, especially if it's not your normal read, you might really enjoy it. It'll definitely appeal to a wider audience though Gina, I think more mature young adult readers need more variety on our shelves, this was just a bit too disturbing for me.